Kinesiology taping is a commonly used intervention for a number of clinical conditions such as muscular pain syndromes, pulled muscles, tendonitis, fasciitis, patella-femoral syndrome, postural correction, and pain associated with pregnancy to name but a few. The aim of the tape is to “facilitate” and “inhibit” muscle function, reposition joints, improve proprioceptive input, prevent injuries and to provide mechanical support without restricting the movements. This is in contrast to the standard rigid tapes on the market. The tape’s intent is to mimic the thickness and flexibility of the human skin and hence makes it comfortable. The tape can be worn 24 hours a day for up to 3-5 days due to its unique physical properties. According to the founder of the technique, this tape causes micro-convolutions or folds in the skin which enables the skin to lift away from the tissue beneath (facia/muscle). This facilitates a release in pressure on the tender tissues underneath and it also provides space for lymphatic drainage. It is claimed that this can hence help to relieve pain, prevent over contraction of the muscles, facilitate lymphatic drainage, decrease bruising and improve joint position. There are no physical product differences between the various coloured tapes (blue, pink, black, purple, beige and patterned). In Japan they use them as a form of colour therapy. Due to its versatility, it can be used in conjunction with many different modalities of treatment. 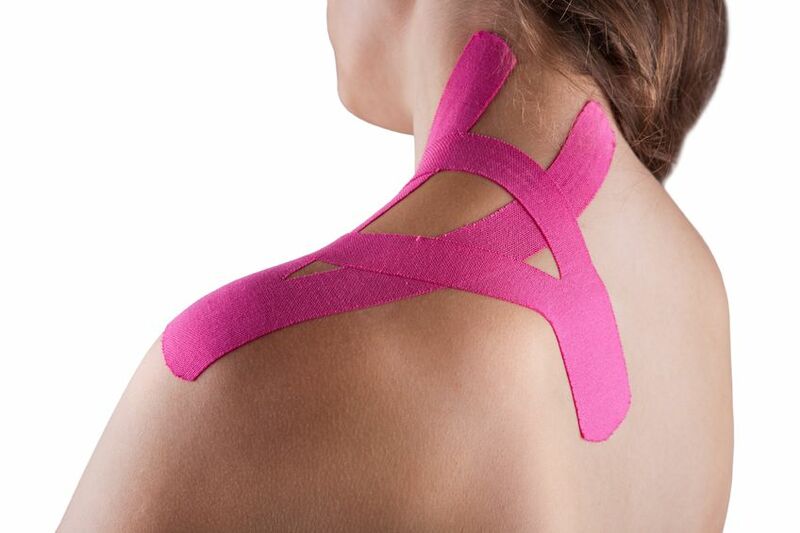 Many physiotherapists around the world have been trained in the application of this tape. You would need to check with your physiotherapist to see if they have been on a course to learn how to apply this tape. All our physiotherapists at PHYSIO FITNESS are fully trained in the application of this tape and have had some excellent results.